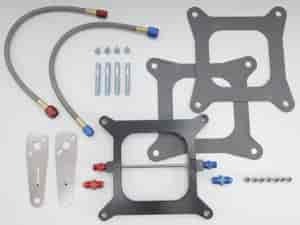 The NOS Carburetor Injector Plates ensure a steady, precisely metered flow of nitrous and fuel into the engine for reliability and are backed by years of dyno and dragstrip testing. They are available for those who want build their own system or do not want to go through the expense of buying a new system. Plates are available in many different styles in both 1/2" and 1" heights. The NOS plates are constructed from die-cast or solid billet aluminum. They include all applicable gaskets, studs, jets and plumbing.